President Donald Trump has jolted the NATO summit in Brussels by turning a spotlight on Germany’s ties to Russia and openly questioning the value of the military alliance that has defined American foreign policy for decades. Merkel hit back immediately, not only denying Trump’s contention but suggesting that his comfortable upbringing in the U.S. gave him no standing to spout off on the world stage about Germany. Poland’s President Andrzej Duda and President Donald Trump have spoken on the sidelines of a NATO summit in Brussels about strengthening military cooperation. The gathering comes just minutes after Trump tweeted “what good is NATO” amid a day of grievances about the decades-old alliance. The Trumps were seen mingling with German Chancellor Angela Merkel hours after the president had criticized Germany for making a gas pipeline deal with Russia. They also spoke with President Recep Tayyip Erdogan (REH’-jehp TY’-ihp UR’-doh-wahn) of Turkey. Trump’s biggest target for criticism, Germany, predicts that it will be spending 1.5 percent of GDP on its military budget by 2024. Contrary to Trump’s assertion, NATO nations committed in 2014 to spending at least 2 percent of GDP on defense, but only by 2024. The second most-powerful Republican in the U.S. Senate says he is sympathetic to President Donald Trump’s assertion that Germany is “captive to Russia” because of its dependence on Russian natural gas and other energy sources. Texas Sen. John Cornyn says he also wishes Germany “would step up and meet their responsibilities under NATO.” Cornyn says it’s pretty clear Germany has decided its relationship with Russia is important to them because Russia is their source of energy. Cornyn said Trump was right to ask whether Germany is “perhaps pulling their punches” with regard to its support for NATO because of its dependency on Russia. Cornyn says he understood what Trump was getting at with his use of the word “captive” but would not have used that specific word himself. U.S. House Speaker Paul Ryan is defending NATO as “indispensable” after President Trump roiled a gathering of the alliance by sharply criticizing Germany. Trump lashed out at German Chancellor Angela Merkel at a summit in Brussels. He claimed that Germany is “totally controlled” by and “captive to Russia” because of an oil and gas pipeline. Asked if he agreed with Trump, Ryan said he’s mentioned “those same concerns” to European leaders about the pipeline, which carries natural gas from Russia to Europe. House Speaker Paul Ryan is defending NATO as “indispensable” after President Donald Trump roiled a gathering of the alliance by sharply criticizing Germany. French President Emmanuel Macron says he disagrees with President Donald Trump’s assessment that Germany is “totally controlled” by Russia because of an oil pipeline. Macron was asked about Trump’s assertion Wednesday as the leaders sat down for talks while both are attending a NATO summit in Brussels. Macron also recalled Trump’s trip to Paris last year for a Bastille Day celebration and said they’ll continue to work together. Trump asserted earlier Wednesday that Germany is “totally controlled” by and “captive to Russia” because of a pipeline project. Trump told reporters that the pair discussed the pipeline during their meeting. He did not elaborate. President Donald Trump says he’s thinking about American farmers even as he meets with NATO allies in Brussels. Critics have warned that Trump’s antagonistic trade moves will harm American farmers who grow crops like soybeans. 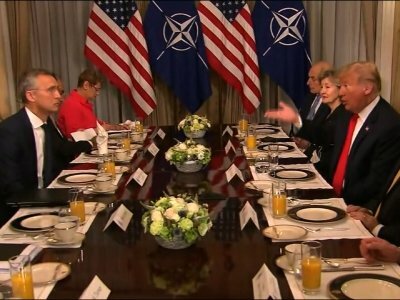 President Donald Trump is participating in a welcome ceremony with fellow NATO leaders at what’s expected to be a fraught meeting of the military alliance. Trump was spotted chatting with British Prime Minister Theresa May and Turkish President Recep Tayyip Erdogan (REH’-jehp TY’-ihp UR’-doh-wahn) during public portions of the opening. Trump fumed during a Wednesday meeting with NATO Secretary-General Jens Stoltenberg that a Russian natural gas pipeline project in Germany is “very inappropriate” as he criticized European countries’ contributions to the mutual-defense alliance. The palace did not specify if the queen’s husband Prince Philip would attend. The 97-year-old Philip has retired from public duties but sometimes appears in public with the queen. The visit is part of Trump’s first trip to Britain since becoming president. President Donald Trump is asserting that Germany is “totally controlled” by and “captive to Russia” over a pipeline project during a testy breakfast with NATO Secretary-General Jens Stoltenberg (yehnz STOHL’-tehn-burg). Trump says of Germany: “We’re supposed to protect you against Russia” and yet you make this deal with Russia. Trump says at the start of his meeting with NATO Secretary-General Jens Stoltenberg that “because of me” NATO has raised more than $40 billion in defense spending. President Donald Trump is meeting with NATO Secretary-General Jens Stoltenberg (yehnz STOHL’-tehn-burg) at the start of a summit of the military alliance. Trump’s day will include a welcome ceremony, a meeting of the North Atlantic Council and a working dinner with some of the same leaders he berated over trade during his last world leaders’ summit in Canada last month. Brussels is the first stop of a weeklong European tour that will include stops in the United Kingdom and a meeting in Helsinki with Russia’s Vladimir Putin.